The best way to see someone's heart is to read a personal letter written to someone they love. 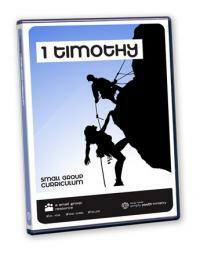 Over five weeks, you'll take your small group through 1 Timothy—a letter from Paul to his good friend Timothy—exploring key facets to a growing and intriguing faith, especially during times of hardship. Help your students develop a long-lasting, vibrant faith. 1 Timothy lessons include: Stand Up and Fight (Character): 1 Timothy 1:18-20 The Family Matters (Holiness): 1 Timothy 3:14-16 Use It or Lose It (Influence): 1 Timothy 4:11-16 Show a Little Kindness (Prejudice): 1 Timothy 5:21-25 Take Care of Business (Faithfulness): 1 Timothy 6:20, 21 You can prepare these lessons as is or customize them for your specific ministry. Everything is editable, so have at it!